Conclusions? Make you own. For me, it looks like our company for surface parking on State House grounds is Dover and Augusta, and I really want to visit Annapolis now. Also, this is really gross in New Jersey, removed a bit from the main State House in Trenton is the New Jersey Departments of Agriculture and Labor. I’m not sure what the Agriculture Department in New Jersey is growing. Gonna play a little devil’s advocate here… but if you only compare our state house (not the parking across the street, because that’s for the state office buildings across the street) with others, it’s not really all that bad, probably equivalent to CT’s. Look just east and west of the CT state house and you’ll see the rest of the state offices along Capitol Ave (west to 84 and east to the end). They have more parking than our state offices. The same goes for VT. You’re looking at the state house, but not the state offices across State St or just east or west. You’re also not taking into consideration the number of VT state offices that are actually in Waterbury (that have lots of parking). Now, realistically, VT is a poor comparison because it’s population is small and spread out and there is no good public transportation. But the fact remains that you’re not looking beyond the state houses in these images except when it comes to Providence. And I’m not saying any of this because I think the state employees need lots of free parking (I think they should pay for parking like the rest of us). 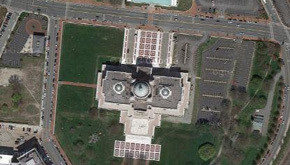 OK, I’ve re-centered the Providence map on the State House itself. I was trying to center maps on Capital Complexes, not necessarily the actual capital building, but I don’t know every state’s capitol grounds layout enough to compare directly. All of the maps are at the same scale. In the Vermont example, yes there may be state offices in Waterbury, but Rhode Island also has state offices in Cranston and Warwick. Each state has remote offices, i.e. the secondary Trenton map I posted. ETA: Maybe I should zoom the maps out once more. I did this scale because some of the State Houses are so small, it is hard to see them at the next further out scale. Readers can zoom in and out as they want to compare I suppose. Trenton is revealed to be much worse at the next level out, but I don’t know if the lots north of the State House there are state lots or not. I think Maine gets an excuse for having lots of parking. Their legislators are coming from all over a large state with very little public transportation. Rhody doesn’t have that excuse. Even worse – there are probably few capitols with a train station within a stone’s throw of the building! If we had a full-time legislature, instead of one that is just showing up after their day jobs, it would be easier for them to use public transit as they would be arriving at the State House on commuter hours. The lots right near the RI State House are mostly for legislators and support personnel. However – when I worked in the State House my parking pass got me into the DOT lot across the street, plus the lot behind that at DOH, and into the parking structure that’s underneath that big ornate walkway next to DOA. It’s three levels – and you can get a van into the lower level but you’re gonna scrape a bit trying to get out, I can tell you that from experience. Yeah, I’ll ignore the VT state offices in Waterbury. But when you look at the maps, you should be able to see the location names of what’s in what building. And based on that, we’re not really all that much different compared to other states (parking right next to the state house being the main difference… though I bet some other states have tunnels or something). If anyone ever gets a chance to visit Trenton, you ought to. It’s both charming and eerily desolate. Like Providence, it’s really been choked-off by highways, which is a shame, because also like Providence, it’s got a good train station, and it has the added advantage of being in a state that takes public transit more seriously. There’s a bike trail on the Pennsylvania side of the Delaware River which is gorgeous, and which is gradually being connected to Philly, but it’s incredibly difficult to get across all of the bridges, because of the way they’ve been configured with respect to the freeways. The bridges themselves are actually very bikeable, and feel to me like the Hawthorne Bridge in Portland always looks, but you have to go over entrance and exit ramps to I-95 that make Providence’s look like they were from Amsterdam. So sad. It’s such a potentially walkable, bikeable city. We have a great opportunity in Rhode Island to create a modern hub of transportation with an emphasis on those commuting to the capital. Providence Station is steps away from the State House and where legislators and visitors should be encouraged (through marketing, planning and design) to utilize the existing infrastructure. Also, moving the bus terminal from Kennedy Plaza to the vacant, undeveloped parcel alongside Providence Station near The Cove would be a tremendous improvement for both downtown and as a modern, multimodal hub for the city-state. Still not sure why these two facilities haven’t been combined and condensed into a single hub, or at least talked about. Expansion of the garage at Providence Station or the addition of a new garage closer to state offices would appease motorists unwilling or unable to commute via public transit and could possibly free up land for further redevelopment and/or reuse the surface lot closest to the state house on the easterly side. Look at all the cars illegally parked on the sidewalk by the Providence AMTRAK station. Despicable. Up here in Maine, we call it “Disgusta”. It’s hard to compare surface lots around a state house without knowing how many employees work in the building, as well as how many state employees work in adjacent buildings. As Tony P said, the lots around DOT and DOH are open to all state employees on Capitol Hill. Then you have to add the parking needs for the public. This was one major reason that the DOT building (across the street from the RI state house) is no longer the home of the DMV. That building became too urban for people trying to conduct DMV business; parking was terrible. Regarding Ethan’s comment about the train station next to the State House, that hardly helps people commute to Providence. It helps people commute OUT OF Providence. As I understand it, a solution for the Amtrak vehicles parked around the station should be solved in the near future. Amtrak is planning to create a parking lot for their vehicles to the northeast of the station (the Capitol Cove side of the building facing the northbound tracks) where there’s a pedestrian walk-thru area, planter masking the tracks, and loading dock area. This would get the vehicles out of the plazas that face the state house and the mall. The reason why there are so many Amtrak and passenger vehicles around the station is that Providence is Amtrak’s security headquarters for the NEC from New York thru Boston. If we’re the Amtrak Security headquarters, you’d think they’d have their own parking lot or something… but I suppose it’s cheaper just to park on the sidewalk. It may not have the most surface parking around it, but I’d argue that the Connecticut State Capitol has the worst parking situation. It’s the only one shown, as far as I can tell, that actually requires you to cross a parking lot to enter it. There should be something more dignified about entering a state house than a Dunkin Donuts, yet in Hartford, to enter both you’ll need to walk through a parking lot. Not surprisingly, state houses in built-up urban areas (Boston, Concord, Annapolis, Trenton) have less surface parking around them than those in park or rural settings (Providence, Hartford, Augusta, Dover, Montpelier). Personally, I like the urban setting better, and love how state houses in Boston and Concord, for example, are right in the city and surrounded by other buildings with some sort of open public space in front or across the street. Concord has plenty of surface parking a few blocks from the State House, but Main Street in front of the State House and for several blocks south is pretty built up. That’s impressive given the large size of the state legislature and the nearly complete lack of public transit. There aren’t many state agencies or offices right around the State House (those tend to be farther out with much more surface parking), but if Concord can provide parking for at least 424 legislators without any surface lots around the State House, so can Providence. I’d also look into Harrisburg, where the state house appears to be in the city a bit more than in Providence, but where it’s still built in a park setting. Pennsylvania is much bigger and has a bigger legislature, yet they seem to have handled parking around the state house much better. I like the idea of moving parking to a garage near the train station in Providence (as well as consolidating transit hubs there). A simple way to promote the train station as a gateway to the State House would be to build a walkway or path connecting the train station with the south face of the State House. It doesn’t have to be as monumental as the main path, but there should be some angled pathway connecting the two. Despite being surrounded by a sea of parking, RIDOT’s HQ has a very good walkscore ranking. Once there is true commitment to the streetcar plan, and an expanded plan hopefully that will connect all the colleges to downtown. They should put a large government/public sector parking structure outside downtown and reclaim all that surface parking lot for green space. These entitled politicians can ride the streetcar, and pay a fare like everybody else. There should be no surface lots on Capitol Hill.